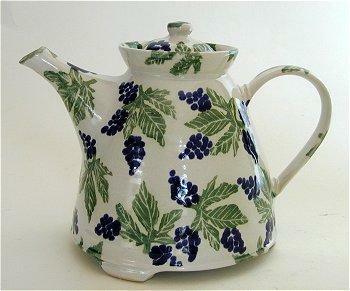 Helen Hewitt has been making and decorating pottery for the past 15 years both in England and Ireland. 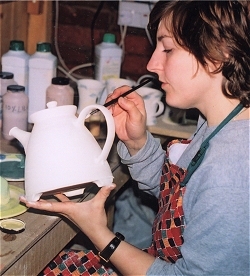 She set up her own pottery studio in Warwickshire, England in 1998 in partnership with her sister Vanessa a textile designer. Since then they have specialised in tableware design, producing a wide range of colourful and practical ware in stoneware clay inspired by the natural world. Each piece is hand thrown and decorated using traditional techniques; it is therefore unique, beautiful, and designed to be functional.Each piece is signed. Hand thrown teapot 9 inches long by 7 inches high. Short three footed as well. Photo shows one of the three supports.